Driving towards High Prairie on Highway 2, I encountered this roadside sign a few kilometres past the western tip of Lesser Slave Lake. Stopping to read it, I didn’t realise how close I was to the place where one of the numbered treaties was signed. Treaty No. 8 was first signed on 21 June 1899 north of here at the western end of Lesser Slave Lake. Spurred by the discovery of gold in the Yukon in 1896, and growing agricultural settlement in the region, Treaty No. 8 was one of a series of treaties the federal government made with the First Nations of Canada. The signatories for the First Nations of the Lesser Slave Lake area were: Chief Keenooshayoo, Moostoos (Sucker Creek), Felix Giroux (Swan River), Weecheewaysis (Driftpile), Charles Neesuetasis (Sawridge), and The Captain (Sturgeon Lake). Treaty Commissioners David Laird, J.A.J. McKenna, and J.H. Ross represented Her Majesty, Queen Victoria. There were also representatives from the Roman Catholic and Anglican churches and the North West Mounted Police present at the signing. The First Nations who signed were promised reserves, education, medicines, annual payments, farm equipment, stock, seed, and ammunition, along with the freedom to hunt, fish and trap and other rights. After careful consideration and negotiation, the First Nations agreed to sign the Treaty. Adhesions to Treaty No. 8 were signed between July 1899 and 1914. The Treaty Commission also traveled with a Scrip Commission which issued certificates called scrip to area Métis. These certificates entitled the bearer to either 240 acres of land or $240 towards the purchase of land. St. Bernard Mission (Church and Cemetery) is a Provincial Historic Resource located nearby in the hamlet of Grouard. Bishop Grouard was a famous Roman Catholic oblate missionary. Bishop Grouard encouraged many tribes to sign Treaty No. 8. 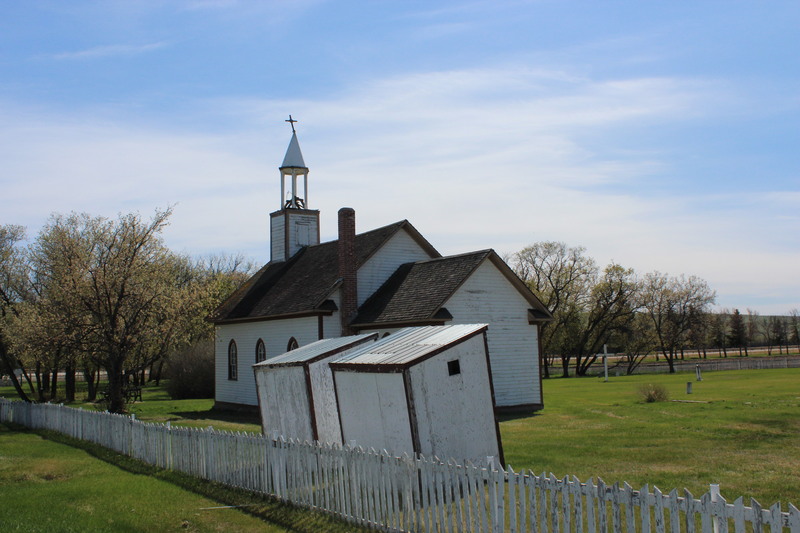 The Alberta Historical Resources Foundation awarded the Municipal District of Big Lakes a grant to aid them in developing a context paper, the first step in completing their first inventory of potential historic places. On June 6th, I facilitated a workshop for members of the M.D. 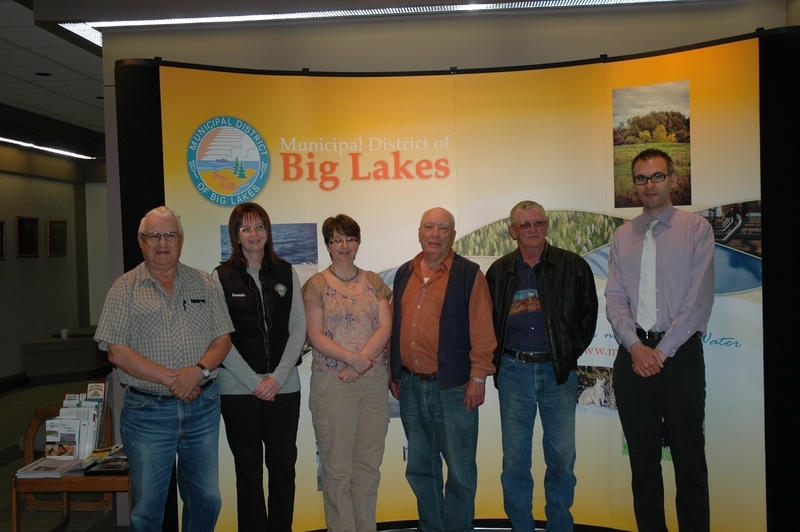 of Big Lakes’s Heritage Advisory Committee. The daylong workshop was about context papers: what they are, what they’re used for and why you cannot identify or understand historic places without them. The committee was appointed by council last year to find ways to protect local historic places. In March, they finished the first phase of a municipal heritage survey. Members of the Heritage Advisory Committee (unless otherwise noted), left to right: Mike Sekulich; Amanda Backs, Assistant Development Officer; Pat Olansky, Community Development Officer; Garth Lodge; Harvey Nielsen; Michael Thome, Municipal Heritage Services Officer. We started the day by discussing heritage value. A context paper at its simplest and most useful is a document that describes a community’s heritage values. What is heritage value? In Canada it is commonly defined as, the aesthetic, historic, scientific, cultural, social or spiritual importance or significance” assigned to a place. In other words, heritage value can be articulated through a historic place’s ability to tell us something about the past: perhaps how people lived during a particular time-period, how a certain type of building was constructed, how an important event took place, among other things. Each community will value the past differently. In fact, members of the same community will think that different aspects of their common history are important. The first step when evaluating historic places is for a community to decide what their common heritage values are. Why is understanding your heritage values so important? Heritage value is communicated through a historic place’s materials and form. It isn’t a place’s age or uniqueness that makes it significant; significance is rooted in a place’s ability to teach us about the past. You can’t decide if something is a historic place unless you understand the heritage values that make your historic places significant. Distinguishing between places with heritage value and old buildings that cannot offer a window into significant aspects of the past is the key. Over the summer, the M.D. of Big Lakes will determine what their community’s heritage values are and describe them in writing. The result is called a context paper. Heritage value can be nebulous, but writing a context paper before looking at specific places helps answer the question “why should we conserve this place”. Once the context paper is finished the Heritage Advisory Committee can determine the significance of potential historic places. Each theme was intended to be a starting point to discuss events, groups or people that reflect the theme; each theme was to be inclusive of all people, places and time periods within the municipality. One of the great parts of my job is the opportunity to learn about each community’s unique history and Big Lakes didn’t disappoint. The committee members began telling stories illustrating some of these themes, talking about events and people that made Big Lakes what it is. In just one afternoon, I learned that mink farming, logging and commercial fishing on Lesser Slave Lake were important sources of income. I learned about the sports days, rodeos and community dances that were the important social events. We started to organise these stories under sub-themes and even components within subthemes. The committee will be working with a consultant on the context paper over the summer. When the committee finishes the framework, the results will be presented to the community for further input and then written up. The context paper will give the Heritage Advisory Committee the framework within which to evaluate individual places for heritage value. If a place contains buildings or other works that illustrate one of the themes from their context paper, it is a historic resource. Evaluating individual places for heritage value will be the subject of a future workshop, probably in the fall. I’m really looking forward to reading drafts of their context paper, in the meantime. The Alberta Historical Resources Foundation has just announced funding of over $1.4 million to 72 heritage projects through two of its grant programs. The Heritage Preservation Partnership Program provides financial assistance to individuals and organizations for initiatives that preserve and interpret Alberta’s heritage through conservation, heritage awareness, publications and research grants as well as scholarships. The Municipal Heritage Partnership Program provides opportunities for municipalities to access funding assistance, expertise and networks to help them establish or maintain existing municipal heritage conservation programs. Read the funding announcement: Government of Alberta information bulletin. 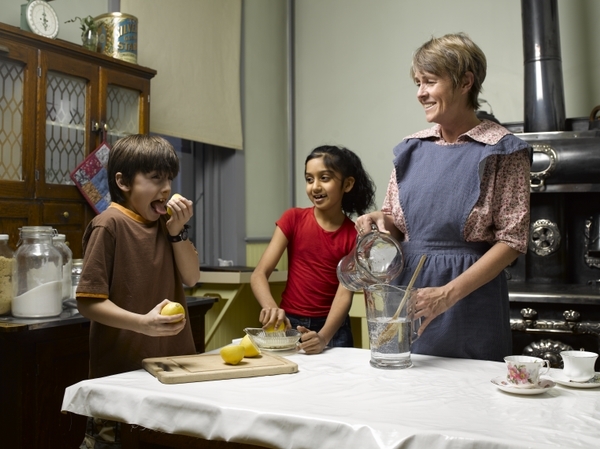 Participate in the Workings of a 1900s Household! 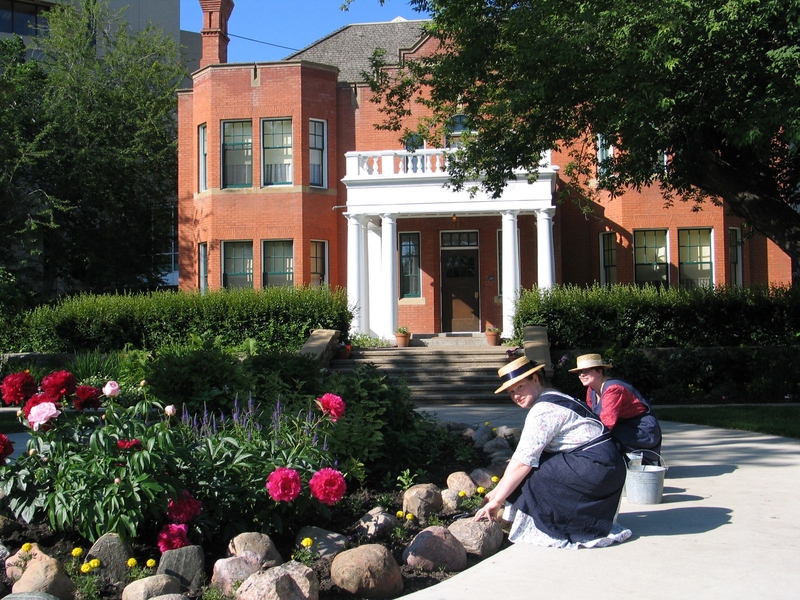 Rutherford House Provincial Historic Site is proud to be a part of Historic Festival & DOORS OPEN Edmonton, July 3 – 8, 2012. This year’s festival theme, “Celebrate our Heritage … our Cities,” commemorates the 100th anniversary of the merger of the cities of Edmonton and Strathcona. The Rutherford family contributed greatly to the history of this community and it is fitting for us to celebrate this milestone. To try your hand at these activities – visit the house between 10:00am – 5:00pm on the indicated day. Rutherford House is located at 11153 Saskatchewan Drive, on the University of Alberta campus. Mr. and Mrs. Rutherford with their 2 small children arrived in the community of South Edmonton in 1895. The terminal station of the C & E Railway was located on the south bank of the North Saskatchewan River, not far from the current Strathcona Farmers Market. South Edmonton was a budding establishment with growing businesses, rapidly expanding land claims and only 1 lawyer. Mr. Rutherford saw an opportunity to establish his law office and settle his family in this flourishing community. South Edmonton later became the Town of Strathcona and in 1912 the cities of Strathcona and North Edmonton joined to form Edmonton. Mr. Rutherford not only had a thriving business in this community, but he held several noteworthy positions, including Secretary-Treasurer of South Edmonton School Board, Secretary-Treasurer of the Town of Strathcona, President of the Strathcona Liberal Association, Deputy Speaker of N.W.T. Legislative Assembly, Alberta’s first Premier and the University of Alberta Chancellor. Mr. Rutherford’s commitment and contributions to his community have left an enduring legacy. Mrs. Rutherford’s commitment to the community was different than Mr. Rutherford’s, but similarly important. She volunteered for the Red Cross, organized charity drives to help the less fortunate and frequently opened her home to fundraising events. She hosted “At Home Teas” and extended an invitation to the community to join her for an afternoon of tea and conversation. Read about other Historic Festival & DOORS OPEN Edmonton events. Rutherford House is also a Provincial Historic Resource. Learn about its heritage value from the Alberta Register of Historic Places. A Big Rock and a Colliery? Whenever I travel Alberta for business I try to return to the office with fodder for future blog posts. As the last instalment from my April 2012 business trip, today’s blog post will feature the Big Rock Erratic, near Okotoks and the Leitch Collieries, in the Crowsnest Pass (near Burmis). 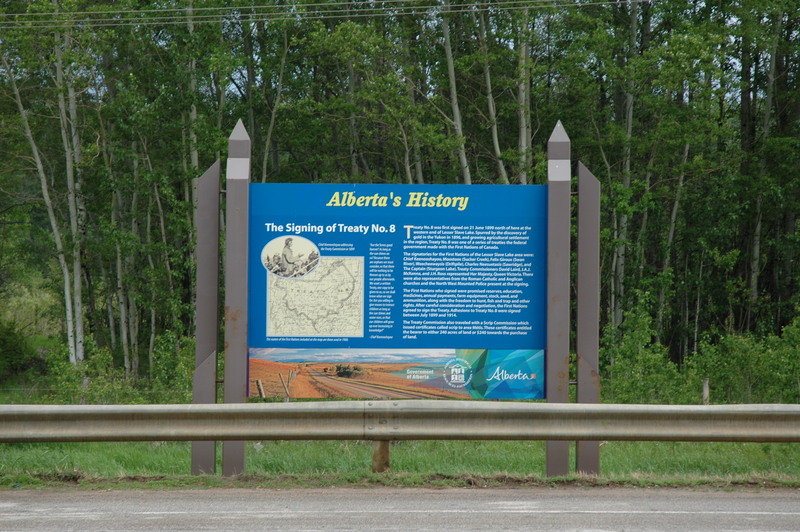 Both sites are formally protected as Provincial Historic Resources and can be found on the Alberta Register of Historic Places. The Burmis Tree: The Most Photographed Tree in Alberta? For those of you wondering if I only write about southern Alberta – don’t worry! At the end of June I will be travelling up to the MD of Opportunity. I wonder what kind of northern Alberta fodder I will discover…. 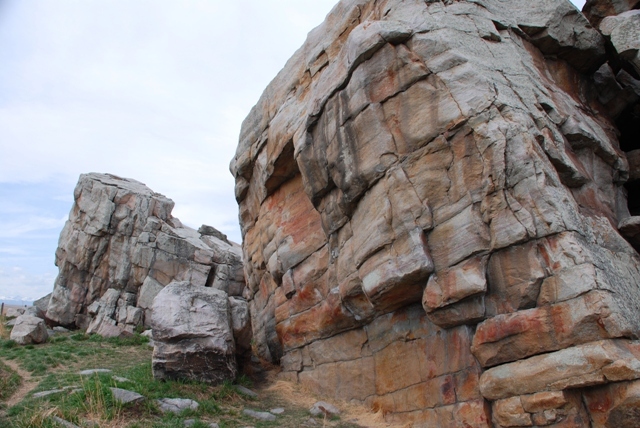 Located off Highway 7, ten kilometres southwest of Okotoks, the Big Rock Erratic is, well, BIG! Measuring 9 metres high, 41 meters long and 18 meters wide, it is the largest rock in the Foothills Erratic Train. Essentially, some 10,000 years ago when the glacier covering the area melted, this rock and others were left behind – far from their mountain origins. Despite erosion, it still serves a huge landmark on the flat prairie. One hot summer day, Napi, the supernatural trickster of the Blackfoot peoples, rested on the rock because the day was warm and he was tired. He spread his robe on the rock, telling the rock to keep the robe in return for letting Napi rest there. Suddenly, the weather changed and Napi became cold as the wind whistled and the rain fell. Napi asked the rock to return his robe, but the rock refused. Napi got mad and just took the clothing. As he strolled away, he heard a loud noise and turning, he saw the rock was rolling after him. Napi ran for his life. The deer, the bison and the pronghorn were Napi’s friends, and they tried to stop the rock by running in front of it. The rock rolled over them. Napi’s last chance was to call on the bats for help. Fortunately, they did better than their hoofed neighbours, and by diving at the rock and colliding with it, one of them finally hit the rock just right and it broke into two pieces. When driving along Highway 7, this site is difficult to miss. A large parking lot accommodates travellers and interpretive signs explain the science behind the rock’s presence. To read more about this site, click here. Note: Quartzite is slippery to climb and although it is hard, pieces can break off in climbers’ hands. Please do not climb the rock, as tempting as it looks. Also, there are aboriginal pictographs on the rock, and these could easily be damaged by climbers. Enjoy the beautiful colours, textures and feel of the rock, but stay on the ground. Please help us protect this Provincial Historical Resource for others to enjoy. When established, in 1907, Leitch Collieries was one of the largest and most ambitious mines located in the Crowsnest Pass. Initially, a washery and tipple were erected along with railway connections to the CPR. By 1910 a total of 101 ovens were installed. A manager’s residence and a combined powerhouse/round house were also built on site. In an area immediately west of the Collieries, the town of Passburg grew. Ultimately, the coal mined at the Collieries turned out to be of poor coking quality and only five of the 101 ovens were used. Poor quality and economic hard times resulted in the company ceasing its operations in 1916. Most of the buildings in Passburg were relocated to Bellvue (another mining community in the Crowsnest Pass). Both a Provincial Historic Resource and a Provincial Historic Site, Leitch Collieries is managed by the Government of Alberta as an interpreted historic site. 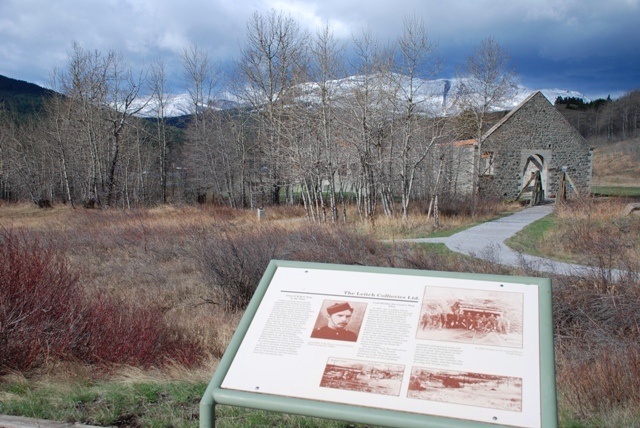 At this site (located just east of the Frank Slide Interpretive Centre on Highway 3), visitors will find the remains of the tipple, powerhouse, coke ovens and manager’s house. Walking paths and interpretive signs allow visitors to explore the buildings and learn about the Collieries operations. The site is staffed from May 15 to Labour Day (10:00am to 5:00pm). After hours, and for the remainder of the year, the site is self-guided. Unfortunately, my visit to Leitch Collieries was very brief. I quickly walked through the site and photographed some of the ruins. The next time you drive through the area consider pulling off the highway – spend some time wandering the remains and learn about an aspect of Alberta’s coal mining history. To read more about this site, click here. 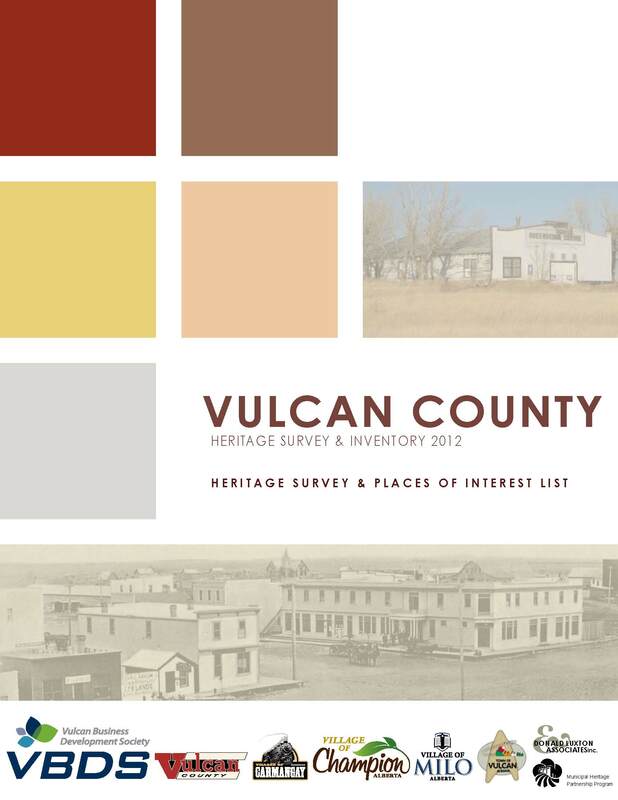 Throughout the last year, one hundred potential historic places in the Vulcan region have been photographed and carefully documented in a Municipal Heritage Survey project. Of these sites, twenty-one were also selected to be evaluated for eligibility, significance and integrity in a Municipal Heritage Inventory project, all to help determine potential candidacy for Municipal Historic Resource designation. For this project, Vulcan County partnered with the Town of Vulcan and the villages of Carmangay, Champion and Milo. Working collaboratively, and with the services of a heritage consultant, a wide range of places were captured. From commercial buildings, residential homes and community churches, to a fire brigade building, a tree, a grain elevator, a railway trestle, a dry ditch and the Vulcan RCAF Station – an array of places were documented, showcasing some of the unique resources in the region. Completing the Municipal Heritage Survey and Inventory projects will allow applicable municipal staff, councillors and residents to better understand the older places that make their communities unique and liveable. From this understanding, municipal officials will be able to make informed decisions about which sites may merit protection and conservation for the benefit and enjoyment of future generations. Essentially, projects like this serve as a foundation for establishing local heritage conservation programs that identify, protect and manage significant historic places and which contribute to sense of place and community identity. To help guide this collaborative initiative, the Vulcan Business Development Society served as lead coordinator. As well, a heritage steering committee comprised of municipal staff and community stakeholders was formed. Together, with the services of a heritage consultant, this project has served as a starting off point for a variety of potential heritage initiatives. PHOTO: Heritage Committee (pictured from left to right): Racille Ellis, Champion Community Representative; Paul Taylor, Town of Vulcan Councillor; Marjorie Weber, Vulcan and District Historical Society; Cody Shearer, Vulcan Business Development Society; Katie Walker, Village of Milo Councillor; Richard Lambert, Vulcan and District Historical Society; Amy Rupp, Village of Champion CAO; Kym Nichols, Village of Carmangay Mayor; Leslie Warren, Vulcan Business Development Society; William Roebuck, Kirkcaldy Community Club; Liza Dawber, Vulcan County. Missing: Bill Lahd, Milo Community Representative. I previously wrote about the Alberta Historical Resources Foundation board receiving a tour of historic places on the Peace River, during their May board meeting (see Part I). This blog post continues that tour with visits to the St. Augustine Roman Catholic Mission and the Twelve Foot Davis grave site. The St. Augustine Roman Catholic Mission is located on the grounds of the Peace River Correctional Centre, south-west of the Town of Peace River. The church was once part of a mission established by the Oblates of Mary Immaculate, a Catholic religious institute of missionary priests. The oblates sent several waves of missionaries to western Canada during the second half of the 19th century. This church was built in 1894 by the oblate missionaries and brothers who ministered to First Nations and settlers in the area. It was part of the settlement that included farm buildings, a school and a small clinic. The vibrant religious community that lived here came to include members of the Sisters of Providence. In 1978 the site was designated a Provincial Historic Resource. Click here to read the Statement of Significance. I first saw the church as we came round a small hill. Its size is striking. Even the most modest modern parish church is much, much larger than this tiny church. This church nevertheless housed a large community of worshippers. Entering the church, the other thing that strikes you is how carefully the building has been designed and decorated. You enter under a choir loft and the elaborate, pre-second Vatican council alter is visible against the opposite wall. Small statues of various saints are set upon wall mounted platforms surrounding the altar. Pointed-arch windows line the long-walls. They are simple but nevertheless designed with great care. The oblates efforts were even more impressive when you consider that these buildings were made of wood they hewed themselves. 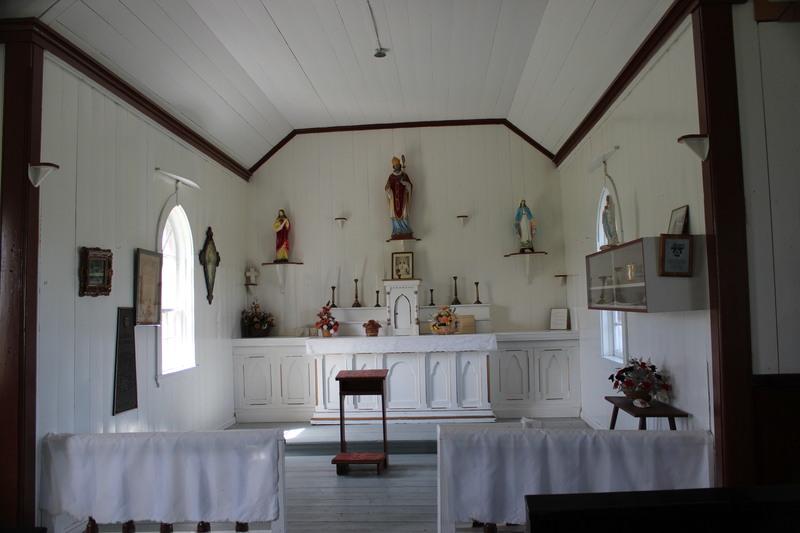 The church was part of a settlement that included farm buildings, a convent and a school. The missionaries first served the surrounding aboriginal community and starting around 1907 the settlers. The sisters and the oblates ministered to the inhabitants and setters in the area, providing a church, school and makeshift hospital. The SS St. Charles, the fist steamboat on the Peace River, was built here in 1903. As the area was opened to settlement, the missionaries offered assistance to the newcomers who often arrived with very little. Later, our tour concluded by visiting the Twelve Foot Davis grave site. Henry Fuller Davis was an American-born prospector who came to Canada to prospect during the Cariboo Gold Rush in the early 1860s. Davis earned his nickname (and a small fortune) by filing a claim on a 12 foot wide piece of land between two existing claims in Barkerville, BC. He subsequently began trading along Peace River in competition to the Hudson’s Bay Company. Davis requested of his friend, Jim Cornwall, that he be interred on a hill overlooking the confluence of the Peace and Smoky rivers. The spot is just adjacent to Greene Valley Provincial Park and offers a magnificent view of the two rivers and the town itself. 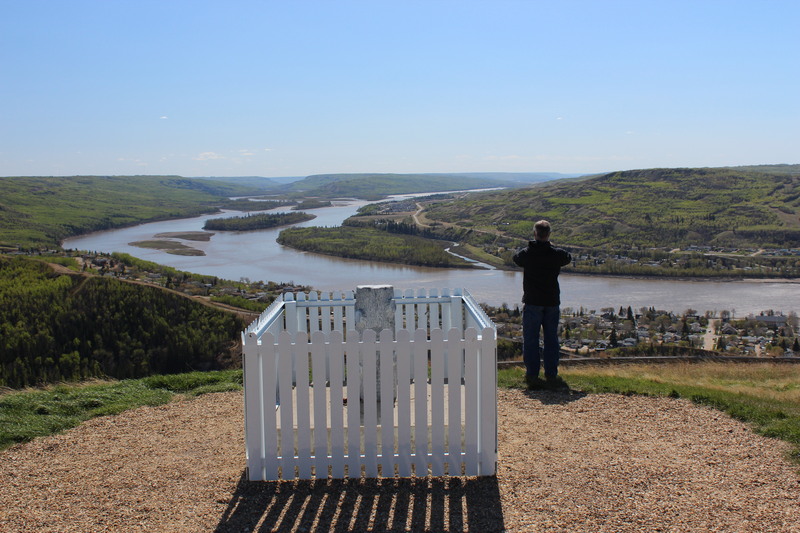 The Town of Peace River, Northern Sunrise County and Alberta Parks jointly oversaw the recent landscaping of the site and installed interpretive markers (including some interesting audio recordings). After taking in the breathtaking views, the board went to a reception hosted by the Peace River Museum, Archives and Mackenzie Centre. 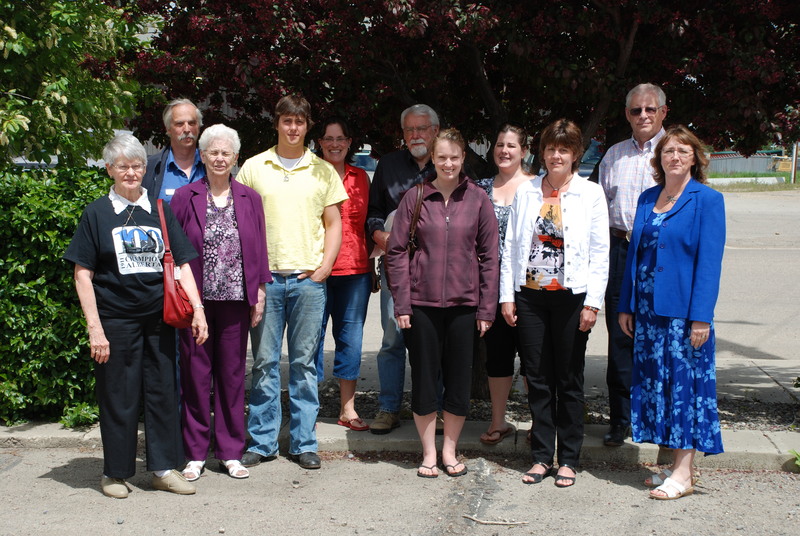 They met members of the Town of Peace River council and many local history enthusiasts. The board had a great discussion the next day and made several funding recommendations (which will be announced as soon as they are finalised. We had a great day and I know the board appreciates learning about how historic sites are conserved and appreciated. Read Tour of the Peace (Part I), which featured the Board’s visit to the Northern Alberta Railway Station and the Shaftesbury Ferry.